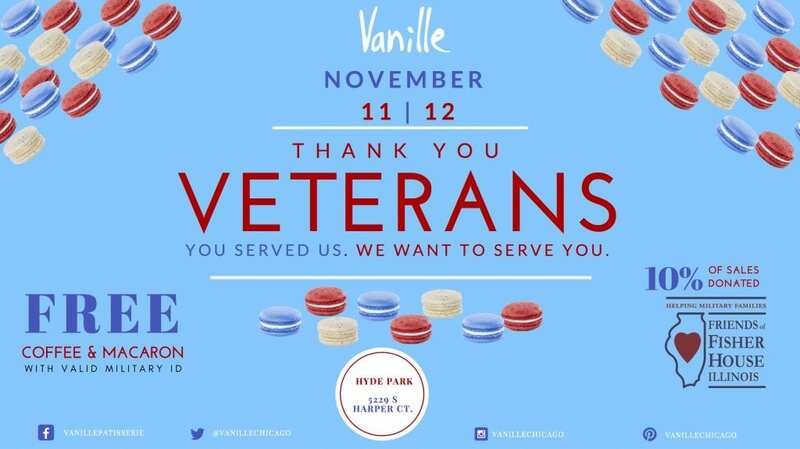 Veterans are invited to visit Harper Court’s Vanille Patisserie on Sunday, November 11 or Monday, November 12 for a free coffee and macaron (with military ID) in honor of Veterans Day. On those two days, Vanille will donate 10-percent of all in-store and online sales (including Thanksgiving pie orders) to the Hines VA Fisher House. Hines VA Fisher House is “a home away from home” for families of active military and veteran patients receiving medical care at the VA medical center. Illinois’ only Fisher House, Hines VA Fisher House, is located on Hines VA Hospital grounds and has hosted 8,000 families to date. This remarkable “comfort home” boasts 20 private bedroom suites with adjoining baths. It is professionally furnished and beautifully decorated. The House accommodates up to 44 family members with no time limit on stays for the thousands of families benefiting from this program. Visit any of Vanille’s four Chicagoland locations in Lincoln Park (2108 N. Clark St.), Lakeview (3243 N. Broadway), Chicago French Market inside Ogilvie Metra Station (131 N. Clinton Ave.), and Hyde Park location (5229 S. Harper Court) to support veterans or make an online purchase at www.vanillepatisserie.com.